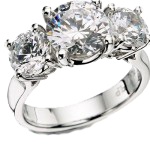 If you have a stone and would like it set into an existing ring or have a ring that the stone has become loose, we can take care of this for you. We do all types of settings from channel, multi-stone, tensions and even solitaires. We have a large assortment of gemstones in stock and findings in stock too. Jewelry restoration requires several technical steps in order to bring each piece as close as possible to its original condition. 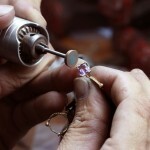 Many processes are used to restore jewelry including cleaning, polishing, replacing lost stones, re-cutting chipped diamonds and gemstones, repairing broken and worn prongs, thickening bezel walls, fixing bent shanks, replacing worn or broken shanks, engraving, even removing incorrect “repairs” and poorly performed solder seams. Did you get a new ring and it just doesn’t fit just right? Do you have an existing special ring that doesn’t fit anymore? 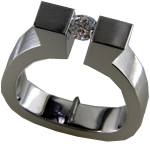 Bring it to us and let us make the perfect fit no matter what type of ring you have.